At Cedarstone Estate there are five bedrooms which all have queen or king size beds, and their own private ensuite. 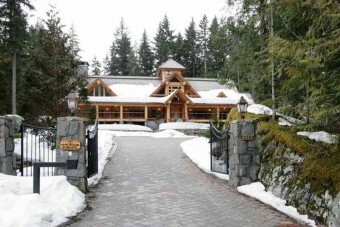 Cedarstone Estate is located only 2km from Whistler Creekside Gondola and is also only minutes from the village. Whistler is 1.5-2 hours from the city of Vancouver. Cedarstone is an impressive estate located only 2km from Whistler Creekside gondola and within minutes from Whistler Village. It is situated on 5.7acres of beautiful forest, ponds, waterfalls and beautiful landscaping whilst still blending in with its natural surroundings. Cedarstone offers the ultimate in luxury being both a popular summer and winter holiday destination. There are five bedrooms at Cedarstone Estate so the private villa can comfortable accommodate 10-12 guests. All rooms have double beds and private ensuites. The house is built with huge floor to ceiling original yellow cedar logs, providing an ideal winter retreat atmosphere. In the main living area there is also an impressive floor to ceiling fire place with large comfortable lounges to relax in. There is also a deluxe sound system including large plasma TV’s and Elan Home Systems Colour Touch control panels. To keep you warm during the winter months there is in floor radiant heating throughout the inside and out. There is an elegantly finished main floor spa room, and all showers have built in granite shelves and seating. All showers are Thermasol steam showers with rain shower heads. Outside there is a hot tub, and a cultured stone sauna. The Estate is wired for cable, satellite, internet and phone and there is an internet based camera system for overall security and viewing from anywhere in the world. Outside, you will find a 3 bay garage with a heated floor and a huge 1000 square foot outdoor entertainment area with a large fireplace. The outdoor lighting is magnificent with 8 tree stumps with up lights. There is also a private forest with a stream. The prices quoted do not include a 13% government tax or a 3% lodging tax. Only 4kms away are tennis courts and a golf course. 2kms away is the Whistler Creekside gondola. Other activities include air tours, river adventures, and mountain trekking. There are also many art galleries near by and also a choice of Health Spas to pamper yourself after a hard day on the slopes!